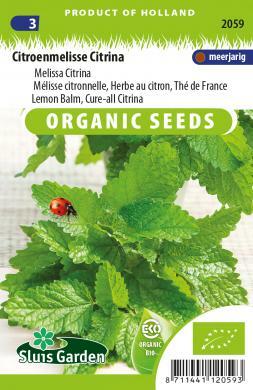 Lemon Balm was already used medicinally more than two thousand years ago by the Greeks. Its scientific name Melissa officinalis refers to the honey bee (Melissa in Greek). Very attractive to bees. When damaged the leaf gives off a mild lemon fragrance, and has a lemon flavour. Delicious in tea and with, for example, fish and salads. Best use fresh leaves. Sow in a greenhouse or in the garden in a seedbed, prick out, then later transplant. Excellent in pots and barrels.